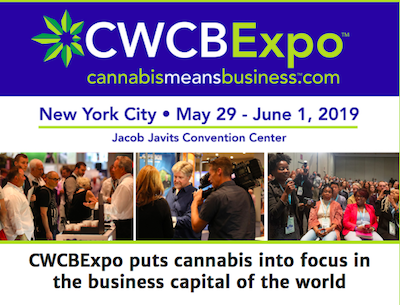 The Cannabis World Congress & Business Exposition (CWCBExpo) will deliver on the hottest cannabis related opportunities in New York City from May 29th – June 1st. « The Cannabis World Congress & Business Exposition (CWCBExpo) is seeking experienced and knowledgeable speakers to present educational seminars, workshops, and panels at our events in New York, Los Angeles and Boston. In this landmark year toward legalization, the CWCBExpo-NY is your destination to network face-to-face with industry leaders, seed to sale services, government regulators, legal experts, growers, entrepreneurs, investors, product manufacturers and suppliers offering the most current business opportunities in the cannabis space. Register Now during Early Bird Pricing for the Conference Program and hear and meet high-caliber speakers and educators who will deliver keynote speeches, panels and conference sessions. CWCBExpo’s comprehensive educational platform offers in-depth information for the beginner to the advanced cannabis professional. Don’t miss your opportunity to be a part of one of the fastest growing industries.